Exelfibre® is natural product that has high content of dietary fibre. It is made from soybean cotyledon therefore it is odour and flavour free. It has 20% functional protein content. It boasts high water absorption capacity of 8-10 times. It lends desirable properties such as moisture retention and cooking loss reduction to all meat product formulations. Suitable for use in the processed and reformed meat industry and as a thickening agent in the food industry. Exelsoy® 933EX is a soy protein isolate for cuttering and tumbling produced from the finest non-GMO raw materials. Provides high gel strength through water binding in a ratio of 1:5. It is an excellent emulsifying agent. It creates a homogenous heat stable emulsion in a ratio of 1:6:6. Product has been designed and produced for use within the meat, poultry and fish processing industries. Bowl cutter emulsions and tumbling solutions. Emulsification of fat and elimination of leakages. Isolated soy protein for energy bars Exelsoy® 950F is derived from finest Non-GMO soybeans. It is neutral in flavour and offers smooth mouthfeel and excellent nutritional properties. For nutrition and health food,sportsman drinks, nutrition bars, energy bars and other extruded food products etc. Exelsoy® 950M is a soy protein isolate for nutrients produced from the finest non-GMO raw material, it has been produced and specially designed for use for nutrition food, health food industry. Exelsoy® 950M is a highly dispersible and soluble Soya protein product with low viscosity and clean flavour. Sports nutrition liquid beverages, liquid meal replacer beverages, soy milk beverages，high-protein powder. Exelsoy® 960 is a soy protein isolate for vegetarian products produced from the finest none-GMO raw materials. Exelsoy® 960 provides low gel strength through water binding in a ratio of 1:5. It is highly soluble and readily dispersible and stable. Vegetarian food, nutrition food, health food industry, like bakery, protein powders, breakfast cereals, nutrition bars, etc. Exelsoy® 995HI is a soy protein isolate for injection produced from the finest non-GMO raw materials. It is highly soluble and has an excellent dispersion in muscles. Product has been designed and produced for use within the meat, poultry and fish processing industries. 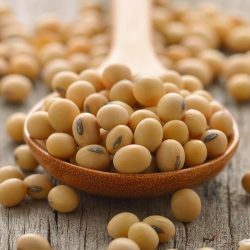 Functional soy protein Exelsoy® F60 is produced from the finest non-GMO, deffated soybeans. It improves texture, forms superior fat emulsion and has excellent water binding capacity in a ratio of 1:5:5. Absorbs more than 5 times its weight in water and remains moisture in high fat formulation. Reduces water release. Variety of bowl cutting technologies. Exelsoy® F70 is a functional soy protein concentrate produced from the finest non-GMO, deffated soybeans. It improves texture, forms superior fat emulsion and has excellent water binding capacity in a ratio of 1:5. Absorbs more than 5 times its weight in water and remains moisture in high fat formulation. Reduces water release. Texta Soja™ 50/70 is made of selected, non-GMO soy. Proteins are texturized by extrusion to give them flakes structure leading to a “fibrous and elastic” texture after rehydration. It is used as meat replacements / analogue (beef, poultry, fish…). It provides functionalities such as: chewing texture, water and fat retention, colour, taste or protein supply.